At the end of week commencing 1st June 2009, 44422 was failed on the Churnet Valley Railway when a heavy knocking noise was found to be emanating from the area of the valve eccentrics. The eccentric assembly (see note 1 below) was stripped down and taken to the LNWR Heritage workshops at Crewe for examination and repair. These are some photographs depicting the components with a basic description of the repair process. 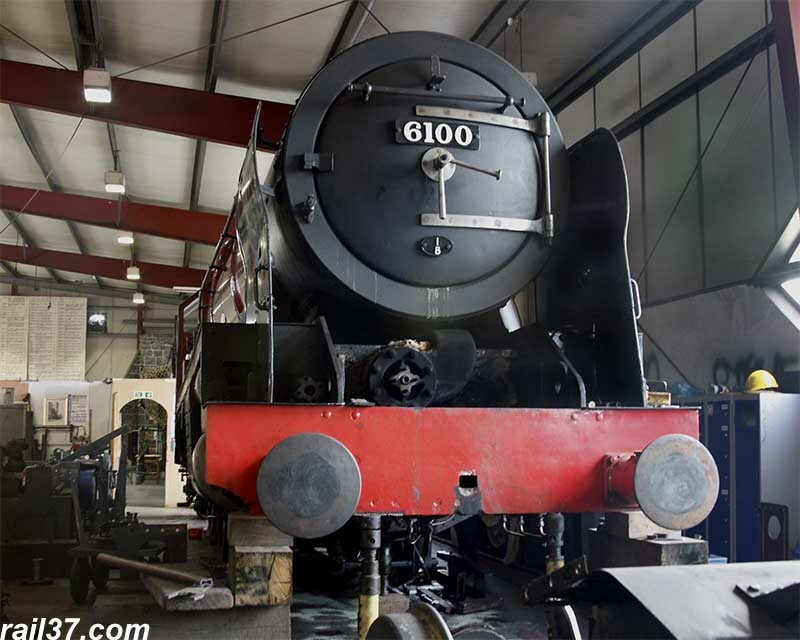 The 44422 LOCOMOTIVE FUND is grateful to the management and staff of LNWR Heritage at Crewe for their generosity in responding so rapidly to the breakdown. When the engine was first overhauled, i.e. 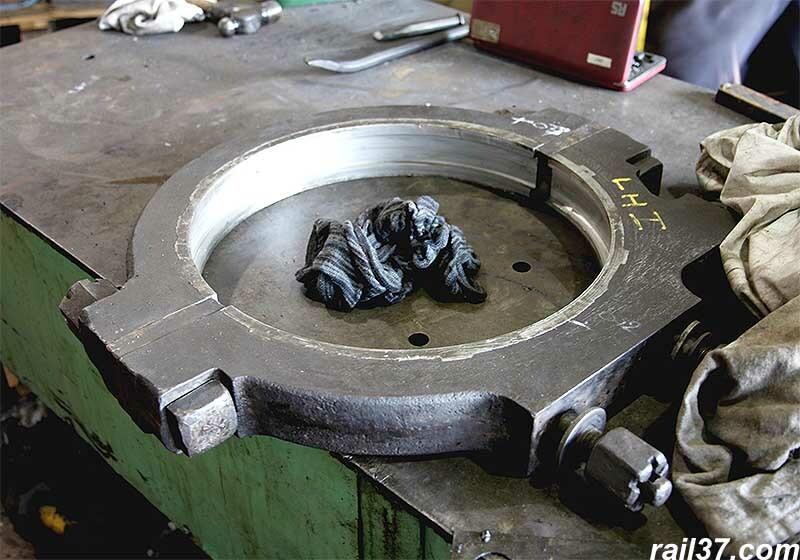 post-Barry scrapyard, it was known that the cam unit was a loose fit onto the axle and, in order to allow the overhaul to proceed without further delay and expense, a shim was wrapped around the axle to allow the cams to be correctly clamped down. This apparent "bodge" (see note 2 below) was known about and has lasted for 15 years of quite heavy service. Unfortunately the shim had literally been pounded into pieces so that the eccentrics were being driven solely by the key which resulted in the knocking that was heard. 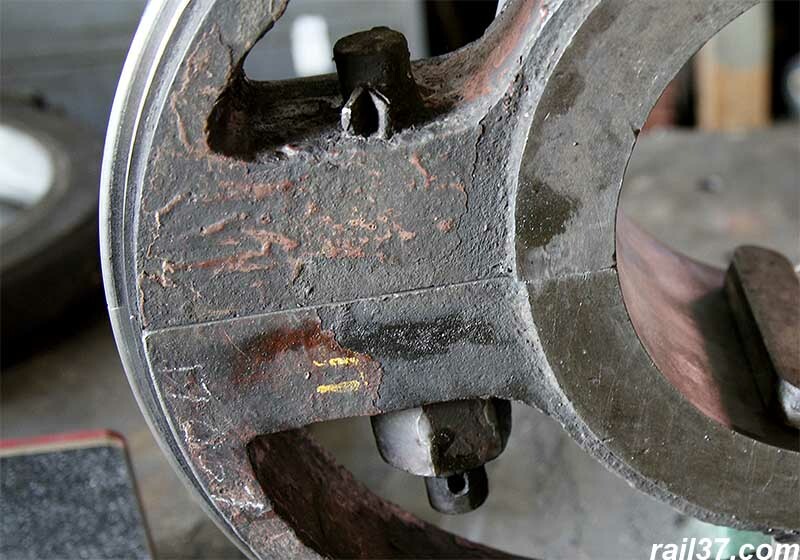 Using the key to drive put undue wear onto the keyway in the bore which consequently increased its width, whereas the axle keyway suffered less. Thus the new key had to be stepped to accommodate the two widths. 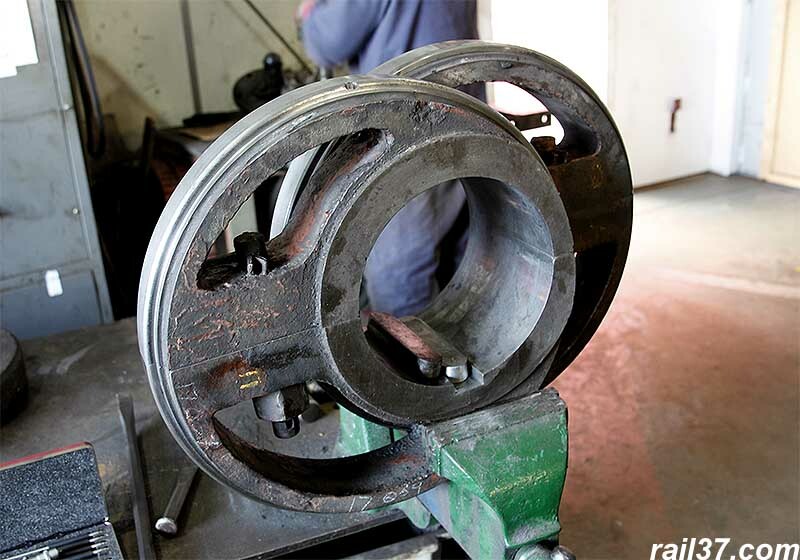 The shimming process will have to be repeated to bring the engine back into service and the eccentric unit is, effectively, scrap and will ultimately have to be replaced. 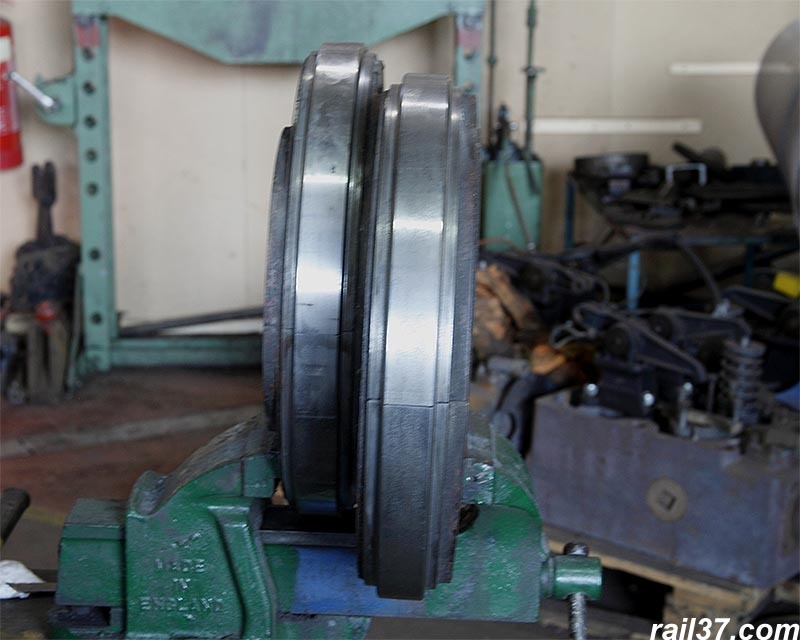 This is the eccentric set which is a cast iron unit that is split and clamped around the driving wheel axle. 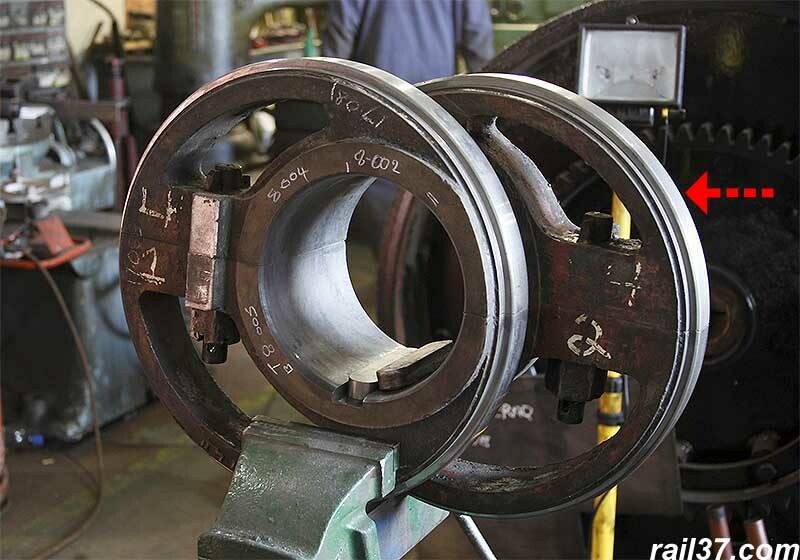 The bore of the unit has a keyway which matches up to a similar slot in the axle. These units provide the reciprocating motion which drives the two valves controlling the entry of steam into the main cylinders. 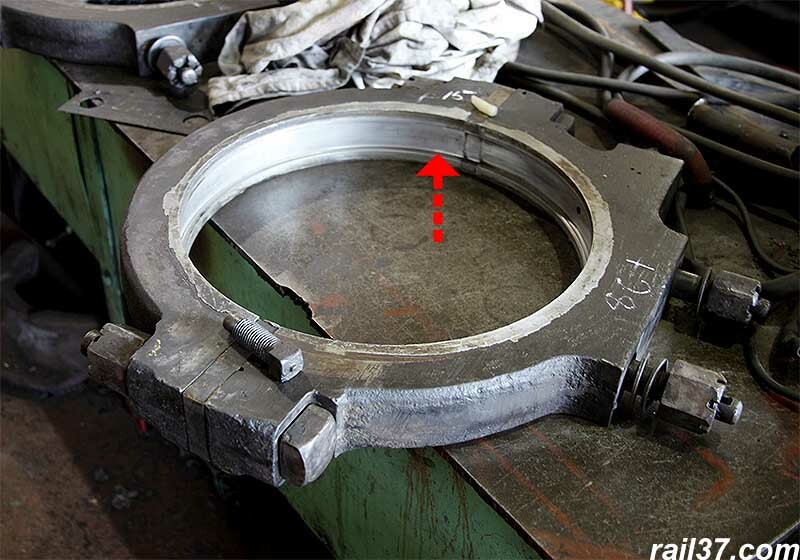 The red arrow shows the internal groove which clamps over the corresponding raised section of the eccentric shown below. Side view of the two units. The key fitted into the keyway is the new one which has had to be stepped in order to accommodate the worn (wider) keyway. The old key is alongside. 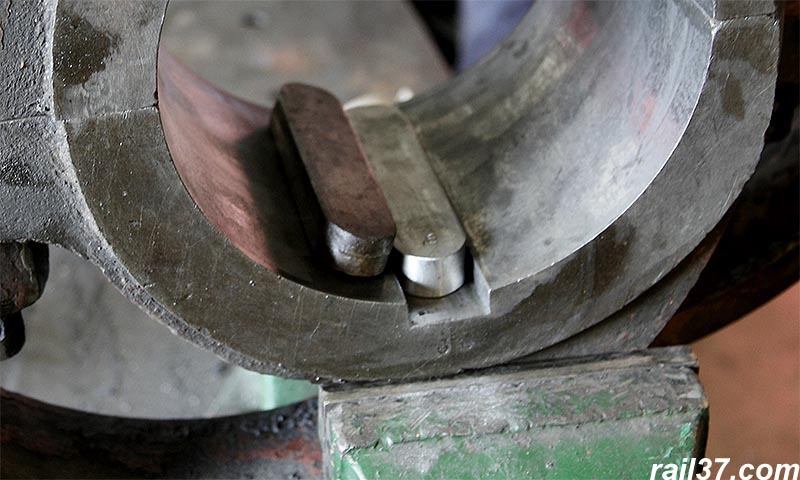 One of the clamp bolts which allows the eccentrics to be split to fit over the axle. The left hand unit . Lurking in the corner of the workshop .